In anticipation of severe transit congestion due to high intercity traffic during the London 2012 Summer Olympics & Paralympics, London’s transport system called for alternate workstyles such as teleworking (a.k.a. telecommuting). Many companies and residents took part in this movement and began teleworking. As a result, in addition to avoiding traffic congestion during the London 2012 Summer Olympics & Paralympics, companies that implemented telework developed infrastructure for business continuity, reported a rise in employee productivity and satisfaction, and improvements to work-life balance. In 2017, a number of Japan’s governmental ministries and agencies (Ministry of Internal Affairs and Communications; Ministry of Health, Labour and Welfare; Ministry of Land, Infrastructure, Transport and Tourism; Cabinet Secretariat; Cabinet Office) followed London’s example and coordinated with financial circles to enact ‘Telework Day’. 24 July was designated as ‘Telework Day’ to coincide with the day of the opening ceremony for the 2020 Olympics, and started at the beginning of the work day commuter rush until 10:30 A.M. Companies/organisations were encouraged to simultaneously telework that day, and ultimately 922 organisations participated (with 548 of them teleworking). Now, in 2018, ‘Telework Day’ has become ‘Telework Days’. Various companies/organisations were encouraged to participate in ‘Telework Days’ on 24 July and starting 23 July (Monday) until 27 July (Friday). The preliminary reports counted 1,682 participating organisations (with 1,260 of them teleworking). ‘CACHATTO’, the telework platform we develop and provide, helps support this event every year. During 2018’s ‘Telework Days’, the CACHATTO Access Point (CACHATTO’s relay cloud) saw double its usual activity. Many of CACHATTO’s user companies, government administrative offices, and municipalities allow BYOD (Bring Your Own Device) with CACHATTO. Without needing to purchase/distribute devices, these organisations provide employees the ability to telework. 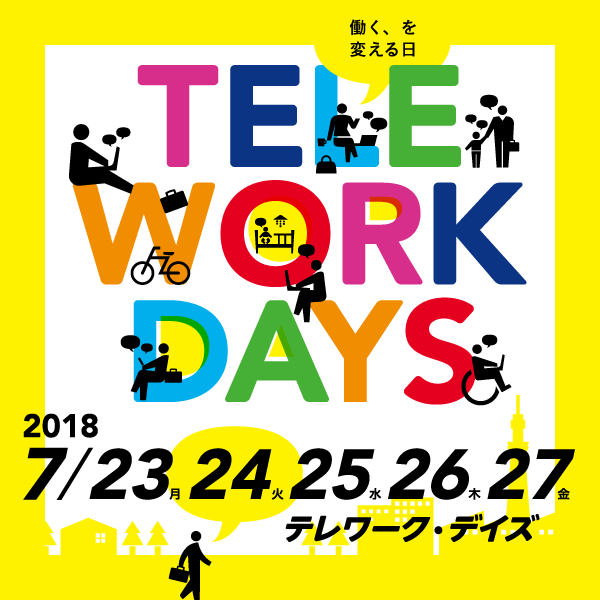 CACHATTO will continue to support Japan’s telework campaign!